If StyleDiary ain’t your thing, my guess is ComicVine could be right up your alley. The site is from the same CNET veterans that created the car social network, Boompa, which we profiled back in June. ComicVine has a very similar interface as the very well designed Boompa. ComicVine is user generated, wiki-like content. Every superhero has his or her own page, with basic bio information as well as a list of “powers,” such as intellect, super strength, and stamina. Here’s Spiderman, for example. Superheroes can also be tagged by users, and a discussion forum is avalable as well. The community, though still small, seems to be very active. Users can create their own superhero as well. This guy, for example, has called himself “Spader-Man,” described as “After being tapped lightly on the head by a radioactive shovel during a school field-trip to the local flea market, Pietro Parkour found himself with incredible, non-trademark-able powers.” Users can also create their own blog within the site. The best part about the site is the absolute rankings of one superhero v. another. Currently Superman is the top ranked hero, followed by The Hulk and then Spiderman. 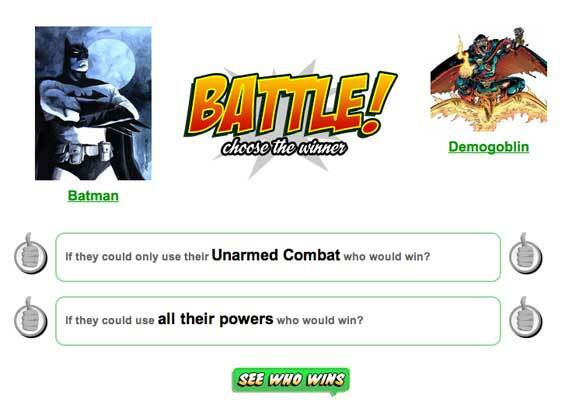 The rankings are user generated via a “HotOrNot” type system where two superheroes are put on screen, and the user votes to say who wins in a battle (see screen shot below). There are more features as well. The video below goes into more detail.